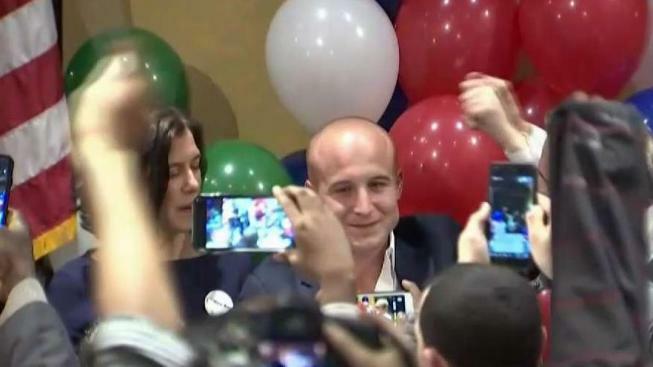 Army veteran Max Rose, a moderate Democrat, defeated U.S. Rep. Dan Donovan on Tuesday, unseating the only Republican member of New York City's congressional delegation. Rose, who was wounded in Afghanistan in 2013, beat the odds in defeating Donovan in a district that covers Staten Island and a small part of Brooklyn. New York's 11th Congressional District was Trump Country in the last national election and the president remains popular in much of suburban Staten Island. A jubilant Rose thanked supporters, at one point letting out an enthusiastic expletive as he praised their fundraising and canvassing efforts. "We were never in this to win an election," Rose said. 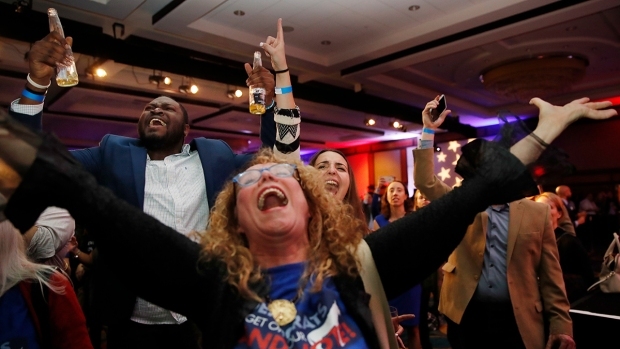 "We were in this to change politics irrevocably in this country." Unlike other Democratic candidates in liberal New York, Rose, a former health care executive who is just 31, didn't make President Donald Trump's leadership a central issue of his campaign. Even as liberal Democrats like Alexandria Ocasio-Cortez soaked up media attention for seeking to push the party to the left, Rose stuck to nonpartisan issues such as the need to rebuild infrastructure and find a way to deal with opioid addiction. He also said during the campaign that he wasn't going to Washington "with a partisan pitchfork in my hand," and was willing to work with the president. Rose said he wouldn't vote to make U.S. Rep. Nancy Pelosi House speaker if elected and criticized New York City's liberal mayor, Bill de Blasio, for "ignoring" Staten Island. Rose also highlighted his military service on the campaign trail. He was one of 19 veterans around the country supported by an effort from the Democratic Congressional Campaign Committee focusing on swing districts. Donovan was Staten Island's district attorney before being elected to Congress in 2015 in a special election to replace former U.S. Rep. Michael Grimm, who pleaded guilty to tax fraud and served prison time. He was re-elected for a full term in 2016, then beat back a spirited challenge from Grimm in this year's Republican primary. "I don't look at this as a sad occasion. I look at this as the end of something that I have enjoyed so much," an emotional Donovan told supporters on Staten Island. "You have given me an opportunity of a lifetime and I will treasure it always." During the primary, Donovan tacked to the right, sparring with Grimm over who would better advance the president's agenda. President Donald Trump ultimately endorsed Donovan, saying Grimm couldn't win in the general election because of his criminal record. For the general election, Donovan swung back toward the center, highlighting instances where he had been an independent voice in Congress, including voting against the Republican tax overhaul. Rose grew up in Brooklyn, and joined the military after being educated at Wesleyan University and the London School of Economics. He was injured in Afghanistan when his vehicle hit an improvised explosive device, and was awarded the Purple Heart and a Bronze Star. He moved to Staten Island in 2015 after leaving active service and remains a captain in the National Guard.